Many Christians are fearful of engaging in conversations about their faith with Jewish peopleknowing that there are complex issues and suspicions that lie deep beneath the surface. And yet there are many points of contact, and much common ground. 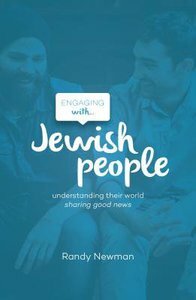 This short book is designed to help both Christians and whole churches understand more about the variety of Jewish people we might work with, meet or know, and to reach out to them with the good news of the gospel. Written at a level that everyone can understand, this book emphasizes the importance of forming loving, honest and open relationships as part of the way we engage with our Jewish friends. About "Engaging With Jewish People: Understanding Their World, Sharing Good News"
Randy Newman has worked with Campus Crusade for more than twenty-five years. He currently works in the Washington, D.C., area, interacting with students, professors, and officers at the Pentagon. He is a frequent conference speaker and specializes in helping people of different backgrounds dialogue about issues of faith.